I always seem to have trouble figuring out what to give my kids for lunch... I don't know why but it's true. I am always on the look out for healthy and quick food that my kids will enjoy so when I was contacted to try out these organic lunch solutions I was happy to do so! We were sent several products to try- R.W. Knudsen Organic Sensible Sippers juice boxes, 2 different Santa Cruz Organic Peanut Butters, and a bunch of Santa Cruz Organic fruit sauces. I have been very impressed with these products! "We are proud to partner with The Berenstain Bears to offer convenient, wholesome, Sensible SippersTM juice boxes for kids. 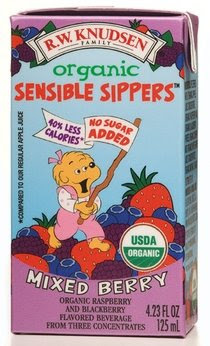 Offered in child-friendly, unbreakable 4.23 oz juice boxes, Sensible SippersTM are certified USDA Organic and feature classic Berenstain characters - such as Papa Bear, Mama Bear, Brother Bear and Sister Bear. True to their name, Sensible SippersTM are 50% organic juice and 50% water, reducing the amount of sugar in each serving without compromising taste. Sensible SippersTM are available in favorite kid flavors: Fruit Punch, Banana, Apple, and Mixed Berry. Parents will delight in the fact that these juices contain 40% fewer calories than regular juice boxes. Additionally, Sensible SippersTM contain no added sugar, artificial flavors or preservatives, and are certified organic in accordance with the USDA's National Organic Program." "Light and dark roasts aren't just for coffee anymore.The Santa Cruz Organic® brand peanut butters are offered in both light and dark roasted, creamy and crunchy varieties. 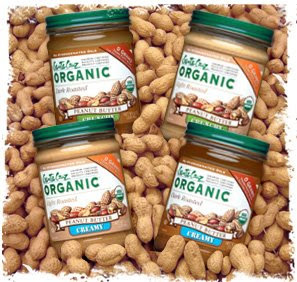 Made with USDA certified organic Spanish peanuts, these nut butters not only taste great, they also contain no hydrogenated oils, no added sugars and no artificial ingredients." We tried the Light Roasted Organic Crunchy Peanut Butter and the Dark Roasted Organic Creamy Peanut Butter. I LOVE them and the kids haven't noticed the change from our old peanut butter... which is perfect! I personally think these peanut butters are one of the yummiest I have tasted... it actually tastes like REAL peanuts. My mom has not stopped raving about the Dark Roasted Peanut Butter since she tried it last week. 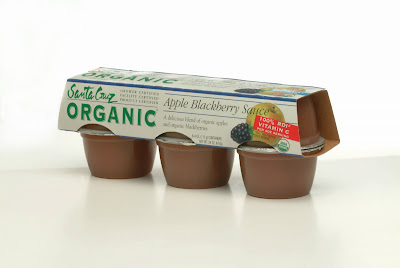 The Santa Cruz Organic® brand has taken applesauce to a new level with its line of organic fruit sauces. The base for all flavors is created by grinding certified USDA organic apples into a smooth, saucy blend. Additions like cinnamon and spices, pureed organic fruits such as blackberries, cherries, strawberries and apricots make for flavors more complex and lively than ever before. You get 100% of your daily value of vitamin C in each 4-ounce serving of the sauce cups - perfect for kids' lunch boxes. See for yourself why the Santa Cruz Organic® brand has received numerous awards and accolades for these outstanding applesauces. Since the Santa Cruz Organic® brand doesn't add sugar to these sauces, pure enjoyment is all you get. Olivia is an applesauce junkie and she has loved the Santa Cruz Organic applesauces. She has eaten at least one a day since they arrived! My personal favourite is the Apple Raspberry Sauce and Olivia seems especially taken with the Apple Blackberry Sauce although we both enjoy all 4 flavours we tried- Apple Raspberry, Apple Apricot, Apple Blackberry, and Apple Cinnamon. These sauces actually taste like the real fruit. They are full of flavour so you really don't miss all that extra sugar. Delicious! If you are looking for some organic lunch solutions I would definitely recommend trying out these great products! Thanks so much to Santa Cruz Organic and R.W. Knudsen for providing the products for this review. I was searching the internet trying to buy it online when I read your blog. Would you please let me know where can I find this great peanut butter?